First of all, let me wish you Merry Christmas and Happy New year. May the melody and spirit of the holidays fill your home with love and peace. I wish you all the best and happy New Year too! 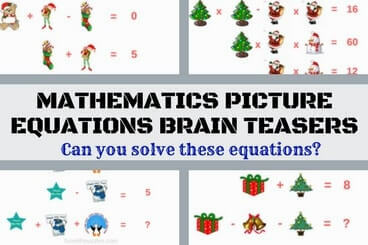 Today Mathematics Equations Brain Teasers are themed on Christmas and New Year. Solving Mathematics Equations becomes more fun when one solves it using pictures. In most of the today's Mathematics brain teasers, we have used the pictures relating to Christmas and New Year. Once again wish all the readers here, Merry Christmas and Happy New Year. 1. Can you solve this Mathematics Picture Equations? 3. Can you solve this Christmas Maths Equations? 4. Can you solve this floral equation brain teaser? 5. Can you solve this fruits equations brain teaser? These Fun Brain Teasers are part of Fun Math Brain Teasers. Below are the similar Maths Picture Brain Teasers to challenge and twist your brain. Fun Math Equations Riddles in Pictures for Kids with answers : This contains Maths Equations Picture Brain Teasers in which your task is solve the given Mathematical Equations. Easy Mathematical Puzzle Questions with Answers for students : These are the easy Maths Picture Puzzles for students which will help them to check their Maths skills. Tricky Maths Mind Game Brain Teasers with Answers and Explanations : This contains some of very tricky Maths Mind Game Brain teasers in which your challenge is find the missing numbers. Mathematics Picture Puzzles Riddles for Teens with answers : At last again simple Maths Equations Riddles which kids and teens will love to solve. Below are the hidden answers of these mathematical equation brain teasers with detailed explanation. FROM EQUATION (3) AND (1), substituting value of T+E. From equation (3), N= 4 .